Halifax is a large town in West Yorkshire, England. The town has 82,056 people living in it. Halifax is close to Huddersfield and Bradford. Halifax is slightly farther away from the major cities of Leeds and Manchester. The economic booms of Leeds and Manchester, particularly in the financial sector, have led to Halifax becoming a commuter town for these two cities. Halifax has a historic town centre. There is a lot of Victorian architecture in the town centre. 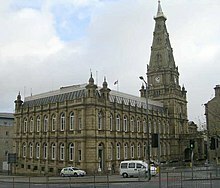 Landmarks include the Town Hall, Piece Hall, the Wainwright monument, the Square Chapel and Halifax Minister. Wikimedia Commons has media related to Halifax, West Yorkshire. This page was last changed on 23 December 2018, at 02:58.